Viscount Christopher Monckton, who has just begun a speaking tour of New Zealand, has responded to an article in the on-line edition of the New Zealand Herald, attacking his qualifications and motives. Lord Monckton comments: “I have attached some recent material, for interest. The paper on climate economics has been accepted for publication in the Annual Proceedings of the World Federation of Scientists, now in its 45th year of publication. My expert-review comments on the forthcoming Fifth Assessment Report will, I hope, demonstrate that I have taken a constructive approach. Dear all, – The letter below, which by this email I am inviting the New Zealand Herald to publish, would help to set the factual record straight. If it is not printed, or if any of the factual inaccuracies that it corrects are edited out before publication, in ten days’ time a complaint will go in the first instance to the Press Council for adjudication of the question whether the offending article was accurate, fair and balanced and whether APNZ and the Herald behaved correctly in printing it without their “journalist” having put to me the numerous scandalously inaccurate statements the “journalist” seems to have invited them to make. I shall invite the Press Council to determine the question whether the Herald has given balanced coverage to both sides of the debate on the climate, having regard not only to the present article but to its previous record of publication on the climate “science” issue. I shall also be complaining to the universities of some of the “scientists” cited in the article, on grounds of serious breach of ethical standards. I shall be inviting the authorities in the United Kingdom to remove the name of one of the universities concerned from the list of academic institutions whose degrees are recognized in Britain. The reason why none of the “scientists” who were so willing to be cavalier with the truth in the article will debate with me is that they are well aware that if they are as malevolently inaccurate about climate “science” as they were about me their inaccuracies will be exposed. It is articles such as this that demonstrate how low the standards both of “scientists” and of “journalists” have sunk, and how far the profession has travelled from the days when both sides of an argument could be fairly and accurately put. I have attached some recent material, for interest. The paper on climate economics has been accepted for publication in the Annual Proceedings of the World Federation of Scientists, now in its 45th year of publication. My expert-review comments on the forthcoming Fifth Assessment Report will, I hope, demonstrate that I have taken a constructive approach. For the sake of correcting the factual record, I am inviting the Climate Science Coalition to post up and circulate widely a copy of my letter to the editor correcting the slew of malicious inaccuracies in the Herald’s article as soon as the Herald has published it, so as to minimize the intended damage to my reputation. When I used to be a journalist, I was taught that one should check the facts before trashing someone’s reputation. It is significant that the “journalist” responsible for the Herald’s inaccurate article failed to make contact either with me or with any of those organizing my tour (whose contact details we can prove he had) before publishing his serial, serious inaccuracies. He should be thoroughly ashamed of his grossly unprofessional misconduct. Sir, – Kiwi scientists rally against climate change sceptic (April 2) twice describes me as a climate change “denier”. That hate speech is inaccurate. I do not deny we can change the climate: I question how much we do. The statement that “New Zealand’s top climate change scientists have rallied together to slam” me is inaccurate. A news agency reporter incited several scientists to comment. He did not let me reply. The statement that I say “New Zealanders … shouldn’t be worried about rising temperatures or sea levels” inaccurately implies they are rising worryingly. Yet the IPCC’s climate-science head says warming has paused for 17 years. Sea level has risen for eight years at just 3.2 cm/century. The statement that I oppose emissions trading because it is “too expensive” is inaccurate. I oppose it because it is cost-ineffective. The statements that I have “no training” and “no scientific training” and have “studiously avoided learning anything about science” are inaccurate. I studied mathematics during my Cambridge degree course, have published several scientific and economic papers on climate change in learned journals, have lectured on climate at faculty level, and was last year’s Nerenberg Lecturer in Mathematics at the University of Western Ontario. The unevidenced statements that I say things scientists “know are not true” and “pick data and statistics to suit [my] argument” are inaccurate. The statement that I once argued for the quarantine of AIDS patients “in internment camp-like facilities” is inaccurate. I argued that, though quarantine (with no mention of internment camps) is the standard public-health response to a new, incurable and fatal infection, Western sensibilities would make it impossible. Tens of millions would die. Sadly, they did. The statement that “the world’s leading scientists” predict the world will “heat up by 3% this century” is inaccurate. They predict 3 Cº warming, up 1%. 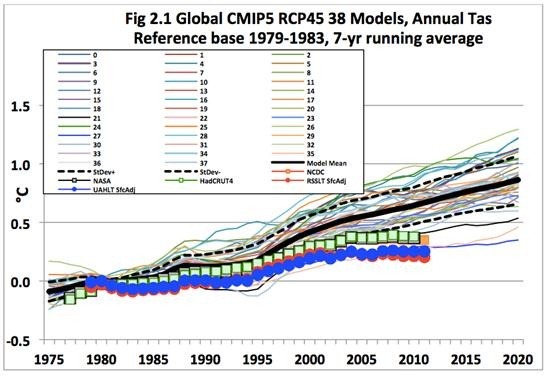 Their predictions in all four IPCC Assessment Reports have proven exaggerated. The implication that I deny any increase in greenhouse gases is inaccurate. I do not deny it: I question whether it matters. The statement that I “promote [my]self as an ‘expert reviewer’ for the IPCC’s forthcoming Fifth Assessment Report”, implying I am not one, is inaccurate. I satisfied the IPCC that my publication record justified my appointment. CM provides his email address and cell phone number. I challenge anyone to contact him. I did (a couple of years ago), and I received a polite and considered response. The climate debate is not a scientific debate but a junior-high, early testosterone-and-estrogen-charged, inner-circle against all others clash. What is ironic is that the middle-class dominant, recently environmentally sensative Westerner is working hard to prevent a projected “hardship” of the poor, still environmentally insensitive developing world that has no interest in working on themselves. For whatever bad things might happen to the China, India, Africa and South American populations, all of them are scurrying to bring CHEAP carbon-based energy to their lives as fast as technically possible. The science is settled and the outcome, certain except where you aren’t likely to find a Stabucks coffee shop. No surprises here. The NZ Herald rather typically manifests the expected critical blindness associated with NZ journalism and media surrounding any ‘climate’ related issue, exalting instead in belief-centered thinking and green ‘feel-good’ fantasies. They are an increasing intellectual embarrassment to all but themselves. What does “Sea level has risen for eight years at just 3.2 cm/century” mean? Wouldn’t the cumulative total of 100 years make more sense? For that matter, wouldn’t it make more sense to look at the temperature rise over the last century rather than solely 17 years beginning with the 1997/98 mega El Niño event? If a journalist wants to verify the credibility of a public speaker, doesn’t it make sense to ask the experts in the field? Wasn’t AGW only supposed to be observable from around 1980 onwards? It never ceases to amaze me how the spruikers of climate change alarm (including “scientists”) cannot get their heads around just where the likes of Monckton and Watts fit in the spectrum of views. Far from being a “denier”, Monckton accepts the IPCC’s RF methodology and can apply it as well as anyone (far better than most of his detractors) and he seems to me to be of the view that there will be continued but non-catastrophic warming because I don’t recall him indicating that he subscribes to solar-centric cooling scenarios or any other non-warming case i.e. he is a luke-warmer not far removed from the very same positions as those that denigrate him. Anthony Watts is in an invidious position too although he gets stick from completely opposing directions but doesn’t it handle it anywhere near as well as Monckton IMO, preferring instead put-downs, patronizing and deferral to Spencer’s website as some sort of argument from the authority of Spencer who is similarly embattled. Problem is, whenever Watts tries to put down the Slayers (now a 200+ member organization of some highly and appropriately qualified individuals) in the odd post, the comments invariably go against him on balance so he shuts down discussion. Sadly, much like the tactics of Skeptical Science and Hot Topic I have to say. If alarmist “scientists” and media hacks get huffy over Monckton’s views in warmist vs luke-warmer debate that they try so desperately to shut down because they really don’t want it exposed to public scrutiny, they would wet their pants if they ever ventured into the completely unfamiliar territory (for them) of luke-warmer vs Slayer debate. If Watts can’t cope, they sure as can’t. Well yes it would Simon because the SLR inflexion occurred 1930 just at the onset of the modern solar Grand Maximum so it makes perfect sense. The CO2 inflexion wasn’t until 1950 on the other hand – that doesn’t male sense at all if CO2 is to be implicated. Vast areas of eastern Pacific with no SLR whatsoever last 20 yrs. Who says that’s the beginning? The non-statistically significant trend now goes back to 23 years in the RSS dataset. But it is this century that is what is invalidating all but 2 or 3 CMIP5 CO2-forced climate models (but different configurations obviously) Simon. No alarming warming in reality vs some radical stuff in most of the models. Experts on what exactly? The future? And I don’t see deferral to experts on thermodynamic radiative energy transfer do you? Spiegel Stops Believing…”Hot Debate Over Climate: How Reliable Are The Prognoses?” Growing Doubts Over Models! In my view the reason that the journalist in question didn’t check his facts is the same reason that most ‘reputable’ scientists denigrate Monckton; they are too lazy or trusting of their authority figures to actually check for themselves. I had a case of this when we asked our own IPCC member if he wanted to debate Monckton. In response we got an excuse for not being there, an I’m-not-a-climate-scientist-anyway, some links to media put-downs and an attachment someone had created primarily detailing the political positions of the audiences Monckton had spoken to. There was never any indication that he had verified any of these claims for himself. If he had he would have found most of them to be false. The issues that are bandied about in these blogs and the media can be very confusing due to claims and counterclaims. Usually you can only reach the bottom of the story after reading all sides, understanding the issues and making your own judgement. Unfortunately most people just don’t have the time, energy or expertise to do this, resulting in the need to take the word of some authority on faith. This is true of both sides of the debate but at least we have people like MacIntyre, Spencer, et al who are good at laying out the arguments so that they can be understood (and critiqued). As for the Slayers, I have not looked closely at much of their work but I did look at Joe Postma’s article on why there was no Greenhouse Effect and found it to be fundamentally flawed. Not that I would expect Joe Public to be able to work this out for themselves but I did write a response to the article I question which Richard has in his possession should there be interest in it. Lord Monckton shows by example how to take on these mainstream stalwarts of propagandising doublespeak. Hold them accountable before the law, before the people and before the board members. Just as a certain group were not intimidated by the apparently unassailable loftiness of the esteemed NIWA, exposing its nefarious and clandestine operations, LM takes on the NZ Horrid and does so with resolve and aplomb. Inspirational as always, Sir – I salute you. I heard LM interview on Newstalk ZB ( Wgt) by Tim ? the other day. Tim clearly stated they had tried to geta climate scientist from NIWA or Victoria University to give the other side of the debate but all declined. So he just had LM on for about 15 mins. It was great. good to hear Tim Fookes challenging Graham’s consensus mantra and sticking to his guns! The Briton’s views were criticised by some New Zealand scientists in an APNZ report last week – but Lord Monckton said it was “hate speech” to describe him as a climate change “denier”. “I do not deny we can change the climate: I question how much we do,” he wrote in response. But contrary to popular belief, he doesn’t deny climate change is happening. “The climate has been changing for 4,567 million years, but man’s influence on it – though not non-existent – is not big enough to be worrying about,” says Lord Monckton. Marcott and other scientists say the long-term context indicates global warming isn’t natural but man-made since the start of the Industrial Revolution. What’s the betting TV3 doesn’t do a follow-up on the Marcott et al controversy? Is your criticism addressed in the Q&A Huub? Question: You and your colleagues at Principia Scientific International claim that climatologists wrongly use a flat earth model of our planet to calculate its energy budget. Why do you say it is wrong to use this simple model that also proves the greenhouse gas effect? Answer: It is precisely because climatologists wrongly model Earth as a flat planet that their crude calculations need to factor in a “greenhouse gas effect” or else the numbers would not balance. We prove in our calculations that flat earth model DOES dilute the power of sunshine; it DOES force you to have to invent an additional heating mechanism to save the appearances. This IS the basis of the GHE and cannot be denied. The very basis of the GHE paradigm is that the sunshine is too cold, and it does this by using P/4, by re-interpreting the OUTPUT response as the input, and incorrectly diluting the power of solar heating etc. Question: Do you and Principia Scientific International have a better model of Earth’s climate? Answer: Yes, but no one understands entirely how our climate works. PSI shows that a real-time spherical model already does most or all of what the additional heating mechanism is said to do in the flat earth model. In an age of supercomputers climatologists have never explained why they don’t even use even a spherical STATIC model instead of their static flat Earth model, at least a 3-D model would at least more realistic, and we would have +49C on the dayside. Or another way of putting it: a real-time realistic spherical model explains how the surface temperature arises from the sunlight alone, and in combo with latent heat explains why the poles are so warm. A diluted sunshine model, whether it is flat earth OR a spherical Earth but still using diluted “averaged” sunshine, has to invent a mechanism to explain the heating in the spherical model that it can’t replicate, and calls it a GHE. See the divorce from reality there? How hyper reality works? Philosophers have described this in detail, this technique that divorces the mind from understanding reality. Question: Your paper says there is no greenhouse gas effect (GHE) because “back radiation” cannot cause any additional heat in the atmosphere nor can it delay cooling. Why is this a big issue? Answer: The IPCC version of the GHE depends upon the idea that the atmosphere provides twice as much heating energy to the Earth than the Sun does, and they do this because of the incorrect dilution of the power of solar heating. The paradigm was created and rests upon the idea that the sunshine is not strong enough to heat the planet all by itself, and backradiation is required to add twice as much heat energy input than the Sun. This is official IPCC science and published in the K&T reference, and many, many, many other places. If we compare the diluted sunshine paradigm, vs. the real-Sun paradigm, ENTIRELY DIFFERENT physical responses in the system naturally occur. Entirely different phase-spaces are created. What the GHE paradigm does is create a GHE to accomplish what the real-sunshine system already does by itself. Question: A large step change in CO2 would initially reduce the out-going radiation at the radiating altitude, which would raise the radiating altitude. This would make the incoming radiation exceed the outgoing radiation that will increase the entire temperature profile resulting in a higher equilibrium surface temperature. Kennedy Graham’s interview was an excellent example of the extreme authoritarianism espoused by the Greens and of a closed mind to all but the message as written by his polemicists. Not many politicians want to relinquish the nonsensical ‘97% of scientists believe’ mantra, and to hear this arrogant goof trot it out tells me all I need to know about the Greens and their desire for absolute control. We have a long history of fighting the forces that would remove our democratic rights, which the moronic (but beautifully spoken) interviewee would have us ignore at our peril. Delingpole is spot on with his description of such people – ‘Green on the outside and Red on the inside’. At the Select Committee hearing into the 2012 ETS Bill, Kennedy Graham asked Terry Dunleavy and I whether all the scientists who belong to the NZ Science Coalition were amongst the 3% who denied climate change. After politely pointing out that none of us denied climate change, I asked him where he had sourced his 97% figure. He said “the IPCC”, and I said “I don’t think so”. I’ve often been intrigued by the term “arm-waving”, so frequently used by the young students who frequent Hot Topic. Now I know exactly what they mean. Dr Graham’s arms flew in all directions as he agreed that the 97% wasn’t quoted directly by the IPCC but everybody knew about it and there had been numerous surveys and, anyway, surely I knew that the numbers were overwhelming. 5. ‘Political correctness’ is a misnomer for media correctness. The worldwide mass media group-think a smug, urban, middle-class, liberal, shallow, predictable code of ethics – and demand that all politicians subscribe. Non-conformity is seen as an outrage. 6. Environmentalism is high fashion and Gaia (animism) fills the gap left by the exit of traditional religion. Practicalities are boring. some good comments too – we’ve been here before ! I can see why Dr Graham backed off debating Monckton last time round, he would have been slaughtered with that level of knowledge. Corroborates Monckton Ron – but I bet Lewandowsky wont write a paper on it e.g. An expert body of the German government memorialized the political philosophy in a comic book (illustrated below, here in PDF), complete with the scientist (Schellnhuber himself in this case) symbolically above the policy maker, describing a planetary boundary condition and as a consequence, President Obama in the panel below expressing concern that action is needed. [Pielke Jnr] Stehr’s explanation aptly summarizes the play book used by the experts at the United Nations meeting described by Leach in their efforts to assert authority over high level decisions on the future course of global development. A primary source for the 97% claims are Doran et al (2009) and Anderegg et al (2010). I believe both are peer reviewed. The former is just over a page long and is well worth a read. See: http://tigger.uic.edu/~pdoran/012009_Doran_final.pdf. 97.4% of “the most specialized and knowledgeable respondents” replied “Yes” to question 2 – some 75 people. Nope. It’s more fundamental than that. He says that the temperature of the Earth will not change because it is already in equilibrium with the Sun. This is not true since it is in equilibrium with the Sun AND space. Slow down the flow of heat to space and the Earth’s temperature will rise. If the temperature of space were to increase for any reason then this flow of heat would slow down since you have reduced the driving force, the temperature difference. This is exactly what you do when you introduce the mirror, which appears warmer than space. To believe otherwise flies in the face of the experimental evidence of countless everyday situations that engineers, such as myself, have to deal with. Agreed but I was looking more broadly than just journalists. 3) there is too little time available to journalists to fact check because the number of journalists available has declined (more journalists are more expensive). Isn’t the system – sun -> major heat-sink (ocean/land) -> minor heat-sink (atmosphere) -> space AND directly to space from surface. A change to the input (the sun) is transmitted, after long-term moderation by ocean and land, to the atmosphere and directly to space. The major moderation being H2O in both heat-sinks. The flow of energy to space is ultimately via radiation, not heat conduction. This is what the Slayers are saying, that space is neutral. A mirror is a reflectance mechanism in terms of radiation, not absorption/re-emission. In other words, the “slowing down” is not due to (some) LWIR redirection but to the heat-sink characteristics of H20 mainly in liquid state. The solar input increased from 1600s to late 1900s and the earth warmed up. The warming continued for a while due to the sustained elevated input level and planetary thermal lag of anything from about 8 to 20 yrs (Abdussamatov, Usoskin, Scafetta). Now the solar input level is falling so OHC will fall in due course and atmospheric temperature will fall. The re-emittance of LWIR cannot be an effective ocean heating agent (10 microns penetration) over and above solar input in which case the oceanic heat-sink does not operate under that driving force but by the sun. The Slayers are saying solar input has been grossly understated and this will be proven (or otherwise) over the next 5 yrs or so because solar input is plummeting and OHC has stabilized at maximum enthalpy (SST is already cooling). It will become apparent very soon (next 1 or 2 yrs even) when OHC and GAT cools in the face of rising GHGs. The action of GHG’s once thermalized is as a coolant, hence the use of CO2 as a refrigerant and its effectiveness (with NO2 I think) in the thermosphere to repel CME energy. This is the Slayers case. The IPCC says the global temperature rose 1.7C in the 20th century. For the last 16 years the IPCC also admit there has been no statistically significant temperature change. And, a mirror is not neutral. Space has a ‘temperature’ of about 3K. A perfect mirror has a ‘temperature’ the same as whatever it sees. Since the flow of heat (whether its transmission mechanism is conduction or radiation) depends on the driving force (the temperature difference) it must respond to the introduction of the mirror. It’s not about esoteric physics, it’s simply the conservation of heat and the simple laws of (heat) flow. Postma’s treatise has not convinced me that the laws of conservation are wrong. I would be pleased if you could point me to the specific words of these learned gentlemen that proves this to be the case. I wasn’t Huub. I was just pointing out that PSI has grown into a formidable force now and that it is them that you have to take your argument to because they are not going away, in fact they are becoming all the more influential. Just take a look at how Anthony Watts retreated recently when his own comment thread went against him. That was due in part to people getting to grips with the Slayers case in entirety and a small measure of how much understanding of it has progressed. In the recent Watts case, he got taken to task for saying the Slayers “misrepresented” (I think the word was) NASA’s press release re CO2 being a coolant in the thermosphere (they didn’t) and he went on to say CO2 acted differently in the troposphere for some reason – how so? The earth is not in equilibrium nor does it have a stable temperature. That was what I was explaining with a system including heat sinks. It takes decades for OHC to equilibrate in response to a change of solar input and is only just now stabilizing from the modern solar Grand Maximum, the onset of which was 1920/30 and peaked around 1986. I didn’t say it was. I said a mirror was reflectance as opposed to space that was neutral in terms of radiation. Postma used the mirror analogy, as I understand, to describe how some think re-emitted LWIR heats the body that emitted the energy in the first place i.e. a body heating itself to an even higher temperature. The Slayers (and myself I have to say) are of the opinion that this is a perpetual motion machine and absurd. But the atmosphere does not reflect, it absorbs and re-emits. There is reflectance from the surface (and scattering) but energy from the sun is progressively degraded (except for reflectance) as it is absorbed/re-emitted/scattered from the surface and same again in the atmosphere. DLR is relatively low grade energy compared to solar SW in terms of intensity and energy-per-photon, thus it cannot raise the energy level of the surface above the level solar SW has raised it and even when energy leaves overnight the matter does not fall to an energy level at which LWIR can heat it except for extremely few and very brief time frames. I searched high and low for papers on this and only came up with studies in the Swiss Alps where the direct sun side of a mountain rock surface was compared to the diffuse sun side. They were able to establish the temperature gradient through the mountain and the relative heating effects. Even diffuse sunlight was a far more effective heating agent than DLR. I documented the entire search and the papers I found in a thread here at CCG somewhere. I might be able to find it again but that would be a search in itself. If LWIR/DLR was an effective heating agent, solar collectors mounted horizontally would effectively harness energy at night. This just doesn’t happen anywhere that I’m aware of. Again, DLR from GHGs and clouds does not penetrate the ocean surface enough (only 10 microns) to be an effective heating agent. The only effect, if any, would be evaporative on the surface molecules. Solar SW on the other hand is a bulk ocean heating agent to several metres deep in the tropics where incidence is vertical. The space-flight experts at PSI (e.g. Latour) say this is a widely held misconception (I include myself until I went through the rationale) and that space is in fact neutral. I suggest you take that up with Dr Pierre Latour directly. Again this was only an analogy for redirected LWIR as I understand. Radiation does not depend on a temperature difference, only that the emitting body has temperature above absolute 0K. Any body above 0K emits radiation in all directions e.g. the sun emits radiation even though there may not be another body in the path of most rays to create a temperature gradient or in other words, radiation just radiates outwards, it does not travel along a path predetermined by temperature differences. Just engage directly with the Slayers Huub. I assure you they will respond accordingly especially if the approach is cordial. Unfortunately the free-for-all skirmishes I’ve followed invariably turn acrimonious which is unproductive and seldom leads to resolution in my view but one-on-one is no problem from what I can gather. Although I haven’t been in your position to really know how that would turn out because my inquiries were not as opposite. I do know that Nasif Nahle is a prickly one though, very difficult to communicate with. I’m curious Huub, are you addressing Postma’s latest paper ‘A Discussion on the Absence of a Measurable Greenhouse Effect’ (that the Q&A linked up-thread refers to) or an earlier one? As the universe expanded, adiabatic cooling caused the energy density of the plasma to decrease until it became favorable for electrons to combine with protons, forming hydrogen atoms. This recombination event happened when the temperature was around 3000 K or when the universe was approximately 379,000 years old. At this point, the photons no longer interacted with the now electrically neutral atoms and began to travel freely through space, resulting in the decoupling of matter and radiation. In 1969 when Armstrong took his ‘giant leap’ to walk on the moon no one at Mission Control was confused about whether space was ‘cold’ or not. Everyone understood that in the airless void outside Earth there was neither ‘hot’ nor ‘cold’ – just emptiness. The reason: Back then, NASA applied the traditional scientific method rather than post-normal science. One of the greatest dangers to the astronauts was not freezing in their suits but getting the excess body heat away from their skin. This is because in a vacuum, with the absence of any molecules, the free exchange of temperature is virtually impossible. NASA then admits, in its ‘Staying Cool in Space’ web page that the “ISS needs huge radiators to get rid of its excess heat.” So much for the ‘cold’ of space! So deadly is the risk of astronauts being cooked alive in the ‘cold’ tin can of the ISS that the vehicle requires 14 honeycombed aluminum panels each measuring 6 by 10 feet (1.8 by 3 meters), for a total of 1680 square feet (156 square meters) of ammonia-tubing-filled heat exchange area just to stay cool. The radiators move energy by radiation, not by conduction/convection. Your mention of Gaia is timely and relevant. James Lovelock, the creator of the Gaia Hypothesis, has sold his home in Devon, UK, and moved to the USA for winters (at least). Main reason? The UK winters are too cold now, and it was costing him thousands of £UK each year to heat his home in Devon.